23 November 2018 (Toronto, ON) —Anna and The Apocalypse (Original Motion Picture Soundtrack) is out today via Interscope Records/Universal Music Canada, the country’s leading music company. The album includes the songs “Soldier At War” and “Hollywood Ending.” Watch the video for “Soldier At War” HERE and “Hollywood Ending” HERE. The Orion Pictures film Anna and The Apocalypse will be released in select theaters November 30th and expand nationwide through December. Listen to Anna and The Apocalypse (Original Motion Picture Soundtrack) HERE. 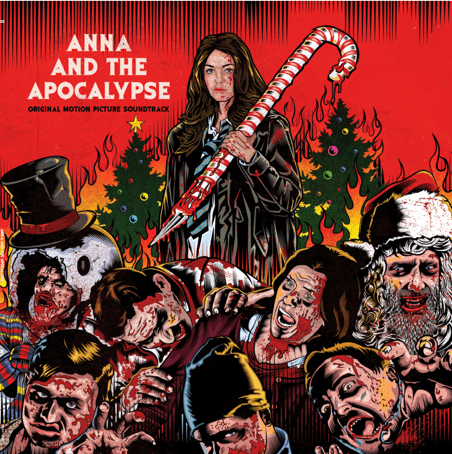 Described as “Shaun of the Dead meets La La Land,” Anna and The Apocalypse follows Anna (Ella Hunt), whose life is dominated by the typical concerns of her youthful peers until the Christmas season brings not Santa but an outbreak of the undead. A zombie apocalypse threatens the sleepy town, forcing Anna and her high school friends to fight, slash and sing their way to survival, facing off in a desperate race to reach their loved ones. But they soon discover that no one is safe in this new world, and with civilization falling apart around them, the only people they can truly rely on are each other. Anna and the Apocalypse is based on the 2010 BAFTA winning short film Zombie Musical; directed by John McPhail (Where Do We Go From Here); written by Alan McDonald and the late Ryan McHenry (Ryan Gosling Won’t Eat His Cereal viral series); with original music by Roddy Hart and Tommy Reilly — a film and TV songwriting partnership from Glasgow, Scotland, who have each released several critically acclaimed solo albums. Watch the trailer HERE. The music for Anna and the Apocalypse combines Hart and Reilly’s love of film with their diverse indie background. Alongside his band The Lonesome Fire, Hart has worked with Coldplay/Morrissey producer Danton Supple and Mogwai/Arab Strap’s Paul Savage. In 2014 he was nominated for the Scottish Album Of The Year Award, which was followed by a six-night residency performing on CBS’ The Late Late Show in the U.S. His most recent record, Swithering, was released late 2016. Reilly received a Scottish BAFTA New Talent nomination for his composition work in 2016. He first rose to prominence after winning the Channel 4 TV show Orange Unsigned. Shortly after, Reilly's first single "Gimme a Call" reached No. 14 on the UK Singles Chart. The soundtrack album art was designed by American artist Jim Evans (T.A.Z.). T.A.Z. designed album artwork and limited-edition posters for rock bands including U2, Pearl Jam, Smashing Pumpkins amongst others. Fans can now turn themselves into the Zombie Snowman from the film with a new custom Snapchat Lens – try it HERE.